ROCHESTER, N.Y. -- The expertise of two regional research teams has earned a federal grant of nearly $20 million to create the nation’s first program dedicated to the study of flavored tobacco. One of only nine projects to earn funding through the federal Tobacco Centers of Regulatory Science (TCORS) program, the WNY Center for Research on Flavored Tobacco Products, or CRoFT, will unite teams from Roswell Park Comprehensive Cancer Center and the University of Rochester Medical Center in an effort to better document and understand one of the fastest-growing trends in tobacco use. The five-year, $19.05 million competitive grant, awarded by the National Cancer Institute, will be shared by Roswell Park and URMC. Based at Roswell Park, the program will be led by Richard O’Connor, Ph.D., and Maciej Goniewicz, Ph.D., Pharm.D., both internationally recognized experts on tobacco use and its health consequences. The Roswell Park team will analyze various combustible and electronic tobacco products, their consequences for health and how users interact with these products. Collaborators from URMC, led by Irfan Rahman, Ph.D., and Deborah Ossip, Ph.D., will contribute critical resources in biomarker screening, genetic analysis and toxicology assessment. “We’re really excited about initiating this work, because no one has ever looked at flavored tobacco in such a comprehensive and systematic way. 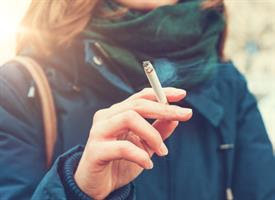 There are so many different flavorings, delivery systems and product options, and so much we don’t know about them,” says O’Connor, professor of Oncology with Roswell Park’s Health Behavior and Epidemiology & Prevention programs and director of the Buffalo cancer center’s Tobacco Research Laboratory. “We’re going to use a lot of different approaches to answer some very important questions: How does the concentration of flavorings affect use? Are there benefits to switching from one type of product to another? Does changing packaging or putting warnings on products change behavior? These are things people want and need to know,” notes Goniewicz, associate professor of Oncology in the Department of Health Behavior at Roswell Park. “One of the most important aspects of this funding is that it will allow us to quickly mobilize to conduct seminars, workshops and other community outreach to inform the public of possible health hazards associated with emerging flavorings in tobacco products,” Ossip adds. Other key collaborators include Maansi Bansal-Travers, Ph.D., M.S., and Martin Mahoney, M.D., Ph.D., from Roswell Park and Scott McIntosh, Ph.D., Scott Steele, Ph.D., Dongmei Li, Ph.D., Isaac Sundar, Ph.D., and Luke Peppone, Ph.D., of URMC.